MSRP: 1,500 Yen ($13.29 U.S. dollars) for the 1/72nd scale set and 1, 700 Yen ($15.07 U.S. dollars for the 1/32nd scale set. I have decided to combine these 2 sets, because the schemes are identical. 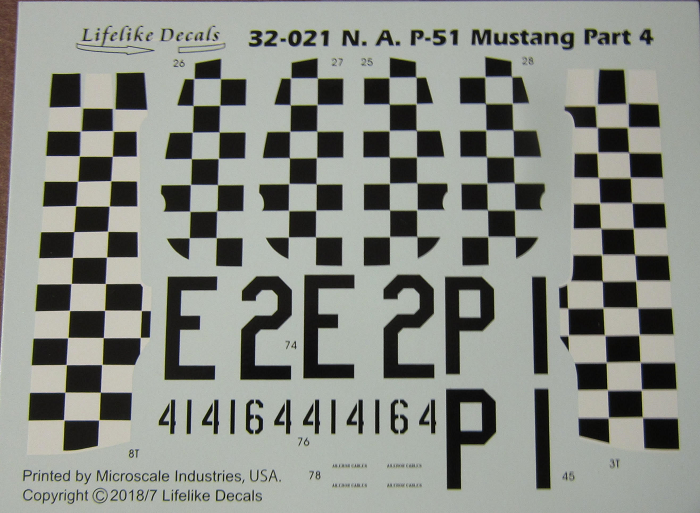 Only the numbers of the individual marks are different and the decal sheets themselves. Lifelike Decals is based in Ikoma, Japan. The decals are printed by Cartograf and Microscale so you know they are the world’s best. They are in perfect register, with good color saturation, and really thin. They will react well with decal setting solutions. The 1/72nd scale set comes in a zip-locked clear cello bag. It contains 3 decal sheets that are joined together and scored to make them easily to separate. The 1/32nd scale set has 4 loose decal sheets in it and also comes in a zip-locked clear cello bag. There are 3 instruction sheets included in both sets. They are pretty much identical. 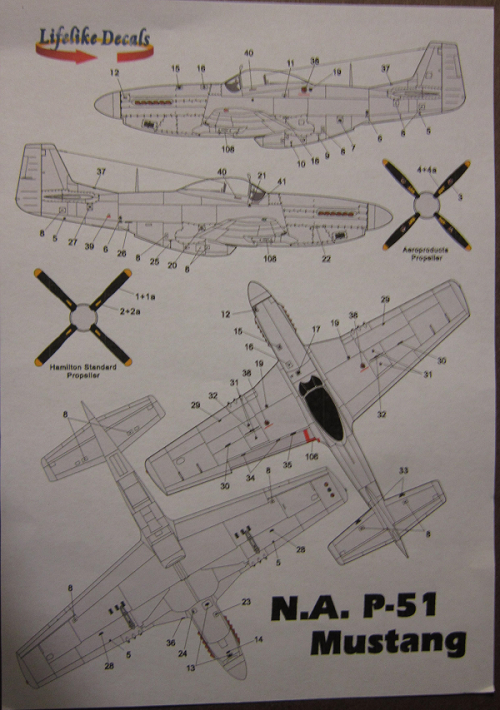 ​P-51D giving the locations of the stencil markings and also 2 illustrations of propellers and their markings on one side of the sheet. This sheet is identical in both sets. 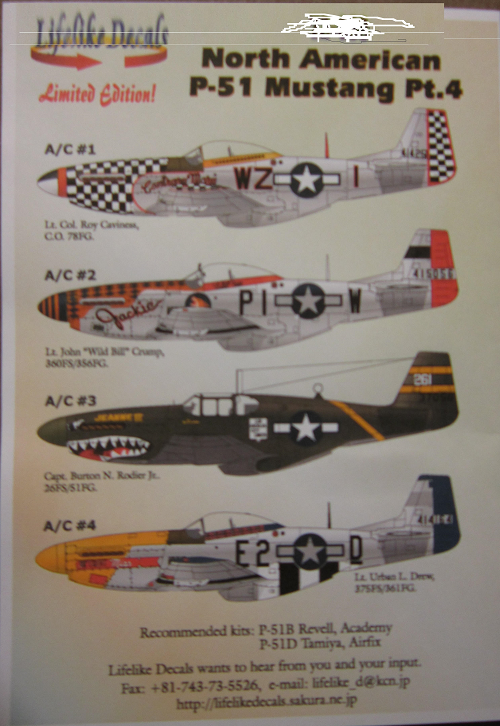 ​A/C #1 is a P-51D-10-NA flown by Lt. Col. Roy Caviness, C.O. of 78th Fighter Group, when the C.O. of the group (Col. John Landers) and 361st FG was later-changed on June 29th, 1945. Only one photo of the aircraft is known, which was taken in Duxford Air Base on Air Force Day (August 1, 1940). Lt. Col. Caviness' mount in 361st FG is the same ser. no. 44-14251, fuse code E9-C, "Goonie II", indicating he took the aircraft to 78th FG. "Contrary Mary" might be a special name he applied on his acrft. for the A.F. Day. It is not known whether "Contrary Mary" was also applied on the right side, but probably not. He adopted a similar marking style as "Big Beautiful Doll" of Col. Landers, re-coding it WZ-I, it is overall bare metal with painting the spinner half black and half white, the nose and wing tip black and white checkerboard as well as the rudder fin. Fuse code had red trim as did the rudder fin. "Contrary Mary" under the cockpit. Bottom of cockpit canopy is orange with black victory markings on it, 14 of them. A/C #2 is a P-51D-15-NA ser. no. 44-15056, flown by Lt. John "Wild Bill" Crump of 350 FS 356 FG, Martlesham Heath, England, April 1945. Acft. is overall bare metal. The decals depicts the marking of "Jackie" in the famous two aerial color photos taken by Herb Rutland in April 1945. These color photos feature nose and spinner is painted in orange-red on which blue diamond and stripes are applied. The canopy frame and rudder flap is red and no invasion stripes are remaining. But, photo evidence shows that this is the 3rd marking of "Jackie". As compared with his 3rd marking, the first marking shows red spinner with no blue bands, no blue diamonds on nose. NMF canopy frame and invasion stripes on lower fuselage (same style as "Detroit Miss", but black and white reversed). The second marking shows addition of blue diamonds on nose to the first marking, but the spinner is still red with no blue bands. The last marking features the spinner is changed to red one with blue band, black band on wings does no extend to flaps, addition of "The Lone Wolf" on the nose art, white band with pilot name on canopy frame and whole rudder was painted in red with re-application of last three digits of serial. no. in yellow (rather broad). 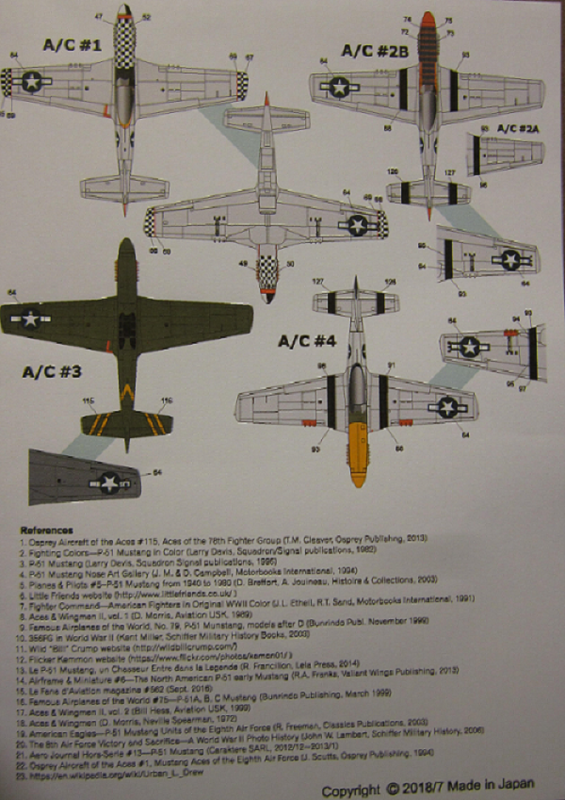 The 2 color side profiles show "Jackie" on one side of nose and "Loraine" on the other side, with a black circle with a howling wolf's head on it below the cockpit and fuse code PI-W in black. A/C #3 is a P-51B-5-NA serial no. 43-7058, flown by Capt. Burton N. Rodler Jr. of 26 FS 51 FG, Kunming, China, September 1944. It is overall olive drab with dark grey undercarriage. It has a shark mouth on the nose with yellow "Jeannie III". There is a white square under the cockpit with black "Los Angeles City Limit" on it. It has a yellow diagonal fuselage band and two horizontal yellow bands on the rudder with a white 261 between them. This is a rather well-known acft. of 51st FG, with full left side shown in references, and now is identified as the personal acft. of Capt. Rodler. Another photo clearly shows the yellow diagonal band and horizontal stripes on the tail, typical of 51st FG in China. "Los Angeles City Limit in the white placard could have been hand printed, but its alphabets are in good register. No photo show its right side, but in all probability there would be no personal mark on that side. Capt. Rodler was born on September 8,1920, and was killed in action on September 5, 1944 near Muong Khuong, Viet Nam with one aerial victory, but regrettably no further war-time career of Capt. Rodler is known. A/C # 4 is a P-51D-10-NA, flown by Lt. Urban Leonard Drew of 375 FS 361 FG, Little Walden, England, October 7,1944. It is overall bare metal, with a yellow nose and spinner, a red bomb with white "Detroit Miss" on it on nose, Black rudder fin, fuse code is black E2-D, ser. no. on tail is 414164 in black. This sheet has top and bottom illustrations on the right. They are identical on both in both the scales sets, except for the numbers of the individual marks. At the bottom of this sheet is LifeLike Decal's FAX no., their e-mail and web addresses. The 3rd instruction sheet is 11 3/4" x 8 1/4" printed on one side in color and folded in the center to fit the zip-locked cello bag. It repeats the 4 side color profiles already described above on the left side and has top and bottom illustrations on the right side over a list of 23 references. ​The color illustrations are identical and so is the text in both sets. Only the numbers of the individual markings is different. 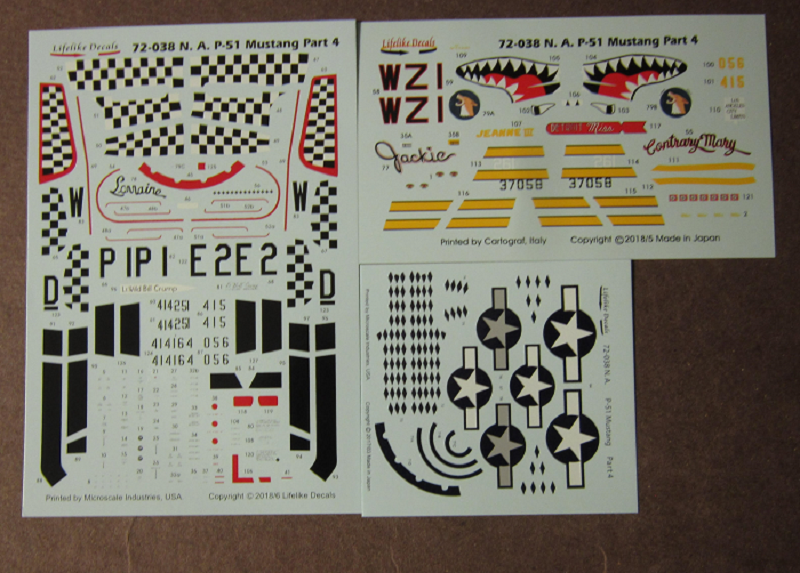 The first 1/72nd scale decal sheet has the checkerboard markings on it, stencil marks, black invasion stripes, ser. no's. 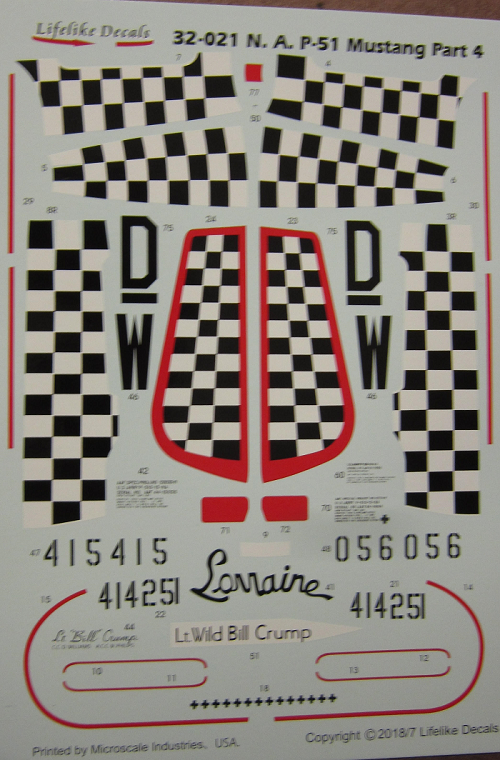 "Lorraine" and fuse code letter D, PI, E2, W & L.
​The second 1/72nd scale decal sheet has the shark mouth, howling wolf head, "Jackie", "Contrary Mary", yellow bars outlined in red and black fuse code WZI. 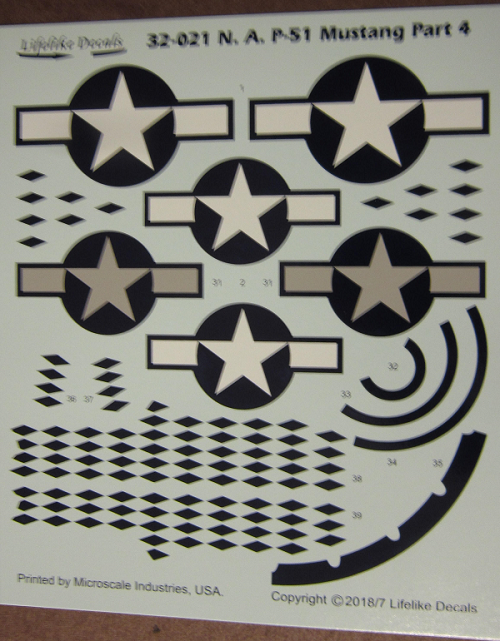 The third 1/72nd scale decal sheet has the stars and bars and diamonds on it. ​The 1/32nd scale sheets are larger, naturally being the large scale. There are 4 sheets. The first sheet has black and white checkerboards on it, fuse letters E, 2, P & I, ser. no. 414164 etc. ​The second sheet has more black and white checkerboards on it with the rudder ones outlined in red. "Lorraine", fuse letters D and W, ser. no's 415415, 414251 & 056 & Lt. Wild Bill Crumps name on it. ​The third sheet has the star and bars on it and the diamonds. 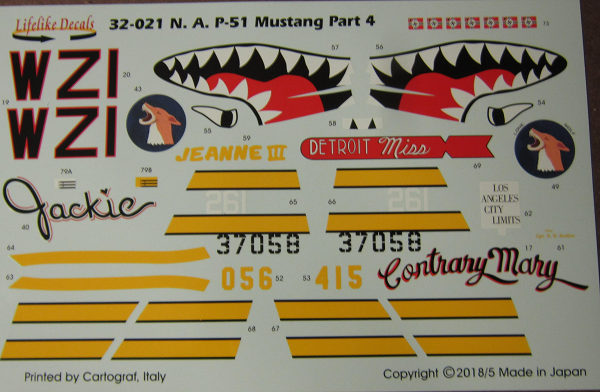 The fourth sheet has the names "Jackie", "Contrary Mary", "Jeanne III" and "Detroit Miss", black code letters WZI, shark mouth and howling wolf and yellow bands outlined in red. "Los Angeles City Limits", ser. no 37058 in black and 056 and 415 in yellow. This sheet printed by Cartograf in Italy. 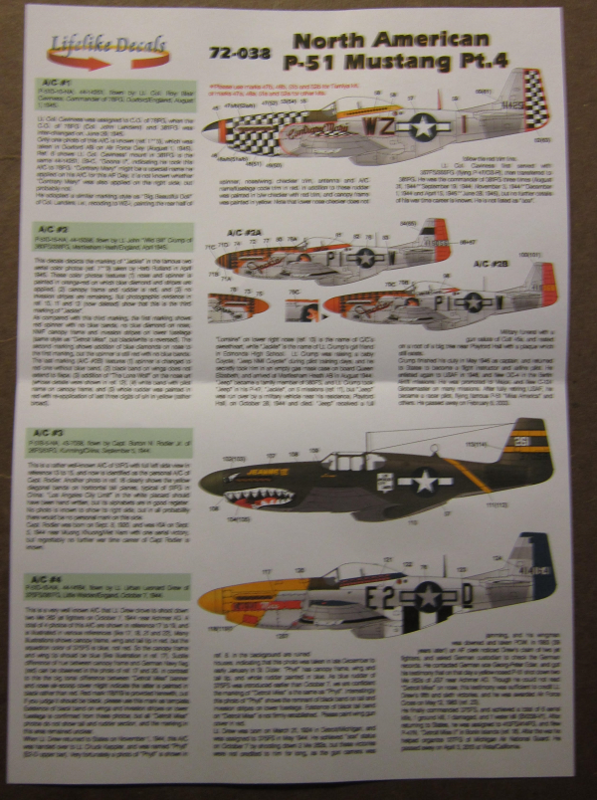 ​These 2 sets will be of great interest to P-51 lovers among modelers and aviation historians.